The Vail Town Council has voted to give approval to an ordinance on first reading that would authorize the redevelopment of the former Roost Lodge property at 1783 N. Frontage Road. The initial approval, with conditions, occurred during the Jan. 17 meeting with a 5-2 vote (Foley, Mason opposed) to support Ordinance No. 35 on first reading. An artist’s rendering of the proposed Vail Marriott Residence Inn. The vote took place following a public hearing which saw numerous citizens voicing both support and opposition to the project, which has been revised from its original application. The project will be reviewed for final consideration by the Town Council during another public hearing on Tuesday, Feb. 21 with opportunities for community members to offer additional comments. 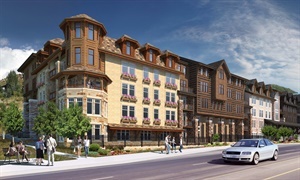 The applicant, Vail Hotel Owner ESHV, LLC, represented by Mauriello Planning Group on behalf of the Marriott Residence Inn, has received a recommendation of approval, with conditions, from the Planning and Environmental Commission to build the project under guidelines associated with the town’s Special Development District process in which setbacks, site coverage, building height, and other prescribed development standards are reviewed for compliance with the town’s development regulations and land use objectives. In instances whereby a deviation from the prescribed standards is requested, it should be determined that such deviation provides public benefits to the town that outweigh any adverse effects of the deviation. The SDD review process requires a recommendation from the PEC to the Town Council. The Town Council is the final decision maker in the review process. During previous reviews by the Town Council, concerns were expressed about the bulk and mass of the project. A revised proposal was presented during the Jan. 17 review which included a lowering of the building height and a reduction in building mass among other modifications. An amendment to the development application reflecting the most recent changes will be submitted to the town’s Community Development Department prior to second reading. The revised development proposal to be reviewed for final consideration for the Marriott Residence Inn includes an extended stay hotel with 170 limited service lodge rooms, fitness facility including swimming pool and hot tubs, a breakfast dining area and similar lodge amenities. As a public benefit, the project also includes a rental apartment component including 102 one- and two-bedroom apartments ranging in size from approximately 600 square feet to 1,200 square feet (reduced from 113). Of the 102 rental apartments, 96 would be deed restricted in perpetuity for employee housing, requiring them to be rented and occupied by Vail residents working at least 30 hours a week in Eagle County. The apartments could not be rented short term as rent by owner units. Also included in the development proposal is a two-level subgrade parking structure containing 331parking spaces (reduced from 360), 29 in excess of town code requirements. The excess parking would be available for use by the public and local businesses. The project also includes a shuttle bus system and a car share program for lodge guests and residents. In exchange for the public benefits of rental housing, additional parking and energy efficiencies, the revised SDD development application continues to deviate from established development standards in some areas of building height, setbacks, site coverage and retaining wall height. To view additional memos on the project, visit the town’s website or to offer public comment in advance of the Feb. 21 meeting, email the Town Council at towncouncil@vailgov.com.